The Lawler Law Office, located in downtown Carbondale, Pennsylvania, has been representing individuals in Northeastern Pennsylvania for over a decade. John Lawler was born in Carbondale, Pennsylvania in 1969. He received a Bachelor of Arts Degree from Fairleigh Dickinson University in Madison New Jersey and his Juris Doctorate from Widener University School of Law in Harrisburg. Attorney Lawler resides in Carbondale. Attorney Lawler is a former Assistant District Attorney and Public Defender in Lackawanna County. He has served as the Solicitor for the City of Carbondale and is the Solicitor for the Lackawanna County Recorder of Deeds. 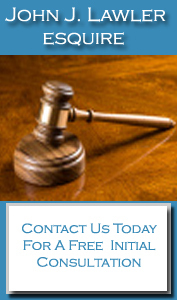 No matter what your legal issue, let Attorney Lawler put his expertise to work for you. The material and information contained in this website is intended to provide information and not legal advice. John J. Lawler, Esquire will provide legal advice or assistance only after a client has entered into a written, signed attorney-client relationship with Attorney Lawler. This website does not create an attorney-client relationship. Additionally, the act of sending e-mail to this firm or downloading information from this website does not alone create an attorney-client relationship. Please note that e-mail on the internet is not secure and that you should avoid sending sensitive, confidential or damaging information via e-mail.